A split decision crossword can be seen to the right. If you've not come across this puzzle type before, then the rules are quite simple. 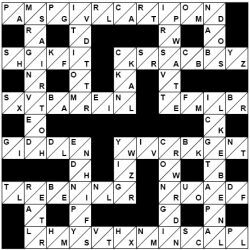 You are presented with a completed crossword grid, rather than an empty one. But there are two possible options for each of the cells that compose the puzzle grid. The aim is to cross out one of the two options for each cell, resulting in a completed valid crossword grid as a result. Sometimes there will be several words that appear to be possible, but as you go through reducing the options there will be just one word that fits in each location allowing you to gradually reduce all cells to having just one letter in. Split decision crosswords are a fun variant on the traditional crossword puzzle and whilst they remove the clue element of the puzzle there is still plenty to keep you occupied whilst solving this puzzle variant. A good starting place is to look for runs where you can instantly see that there is only one possible combination of letters. Pay particular attention as you go through solving the puzzle to the crossovers, remembering that the letter must be one that can form a word in both the across and the down clue of which it is a member: sometimes you will require this rule in order to reduce the options and ultimately to solve the puzzle. We can supply split decision puzzles in a range of grid sizes and levels of difficulty. If you are interested in buying this novelty crossword variation for publication then please contact us; puzzles are supplied in print ready PDF with solution.